Day 4 – I am Sparta! I know I left you last night saying I was going to tell you all about our experience finding our flat here in Prague, well I’ve changed my mind and I want to share my thoughts on my night at the Ice Hockey. (Stop complaining, I’m on my holiday, I can do whatever I like!). Karen had asked whether there was any Sport on when we were away. Karen has a limited selection of sports that she likes; ones on ice (so Ice Dancing and Ice Hockey), fast ones (Basketball and Ice Hockey) and ones which require a degree in mathematics to make sense of the stats (Baseball, American Football and this season, T20 cricket). Because of her misspent youth at the ice rink at Crowtree Leisure Centre in Sunderland, she has an unnerving knowledge of the ins an outs of Ice Hockey for someone from the UK. I think she is also drawn to the smell of rubber flooring soaked in vinegar. I have been to several Ice Hockey games over the years (Durham Wasps, Blackburn Hawks, Manchester Phoenix, Riga Dynamo (spot the odd one out there!)) so am familiar with the “robust” nature of the game and the razzmatazz that goes with it. This game however reached new highs (and lows). There are 2 teams in Prague. HC Slavia (who play in the O2 Arena) and HC Sparta (who play in the Tipsport Arena, formerly known as a communist air hanger). You get the impression there is definite Liverpool/Everton set up here, or even a Liverpool/Tranmere relationship. Their arena was designed in 1952 and finally opened in 1962 (there is a lot of concrete to mix for this place, and I’m guessing in those days it was all done by hand). Our first surprise came when we when we found our seats (which we paid all of 6 pounds for) only to discover they were actually benches for 3 (very cosy). Another more pleasant surprise was that you could get a pint of beer and pint of coke for approx one pound twenty! You could get a sausage for the same price. In the interval I did just that. I wish I hadn’t as I can still taste it now and I think I may be burping it well into the wee small hours. But less about the food, what about the game. Actually, no, the next most signifiant thing about the evening was the mascot. The team is called Sparta and so their mascot is a muscly (well foam muscled) character called “Spartak”. If you have ever seen the Zach Snider film about the Spartans called “300” starring Gerrard Butler, then you will know that main talking points were about how well oiled the men were, how tight the leather shorts were and how…well…camp the whole thing was. Spartak took camp Spartans to a whole new level. Never have I seen a mascot pull shapes like he did. I imagine he is now in a Prague night club burning up the dance floor. If he went into battle busting those moves, they enemy wouldn’t know whether to fight him or buy him a drink and chat him up. Anyway, the game. No hold on. Just one more thing. I saw something else at this game which I have never seen before. At random points throughout the game, 2 teams of girls, wearing off the shoulder mini dresses would skate on with a dust pan and brush to clear the ice in front of the goal mouths. What was that all about? Right, the game. It was between Sparta and Vaxjo (who were from Sweden). 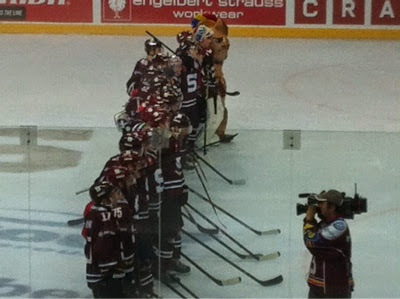 It was the opening game in the Champions Ice Hockey League. I’ll be honest, it felt like a first round fixture in the Europa League which takes place at the beginning of August before the domestic season starts. Less than 2,000 Prague-ians dragged themselves away from the lovely late Summer evening into Sparta’s bunker. The first third was turgid to say the least, but the 2nd and 3rd period really hotted up and Sparta won 5:4. There was some fighting, some people got sent off for a bit and sometimes the ref went off to ring up his mate to see if it was a goal or not. As I say, Karen is the Ice Hockey fan. Tonight I only had eyes for Spartak. Plain flour, sugar and salt and mix. Warm the milk. Crumble the yeast in the milk and melted butter together to add to the flour. Kneading process all ingredients to a smooth dough. Cover it in a warm place and let rise for about 30 minutes. Wash the plums, cut in half and stones. Knead the dough again and roll it on a baking tray lined with baking paper. Put the plums on top and lightly press down into the dough. Then let the cake still rise for 30 minutes. Bake in a preheated oven (electric oven 200 ° C / gas level 3) 35 to 40 minutes. The baked cake sprinkle with crystal sugar and serve.